Since there is already a thread about character sketches and modeling assets I thought it was time to make some collective decisions about the overall look and feel of the dry run project: "Easy Come Easy Go". In this thread I would like to collect opinions about style and look of the short, so that we can better unify the character sketches and modeling assets. Selecting a style can help the modelers as the models should look like they all belong together in the same environment even if they are modeled by different people. 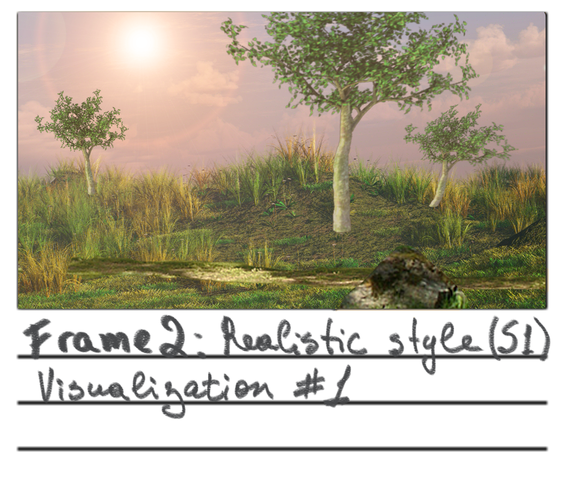 -- a semi-realistic environment with some detailed plants and more realistic skies and lighting. 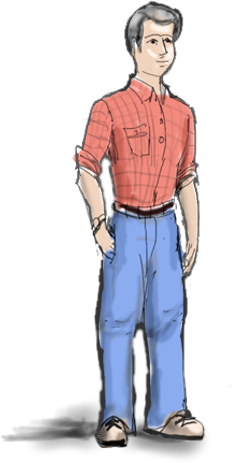 This could go nicely with the Man character, if he is not modeled as too cartoony. Could also give the finished short a more realistic "that's life" feel. 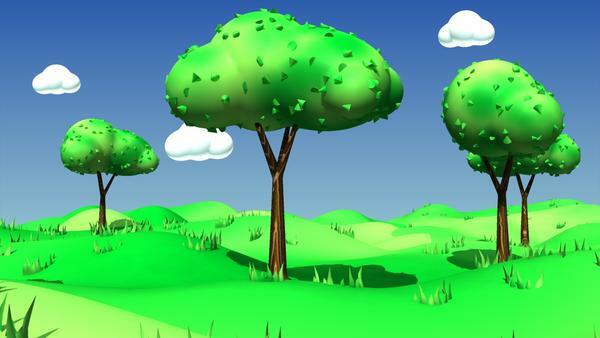 -- a cheerful looking sunny park (would work for both the Man and the Kid characters) -- all bright colors and rounded cartoony shapes. Some toony flowers at the edge of the road. This could also work with the "Teen" for a slight "fish out of water" effect and to make him really stand out. The style would be good for a lighthearted comedic mood for this short. 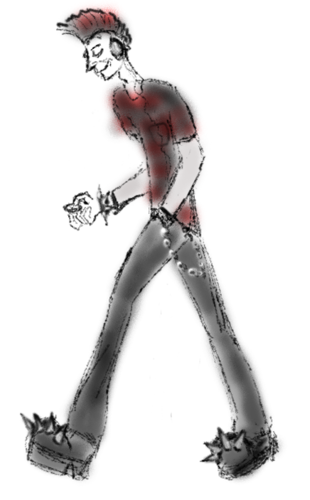 -- a more elongated and stylized gothic style to fit the Teen character. Sedated minimal colors, more grays and purples. Darker textures. I think this style would put the emphasis on the "easy" part of the original concept. Please chime in on your preferences, other potential options and whether you agree with the interpretations I've outlined. And maybe the producers could either set up a poll or make some executive decisions (or appoint people to make them) so that the decisions would start happening and the project could get some unified direction. Well your first style option for the "Man" option is close to what I was going for but I would tend to go for the contrast between the realistic background and the cartoon Man. I really think the Teen and the Cartoony or realistic background would work. 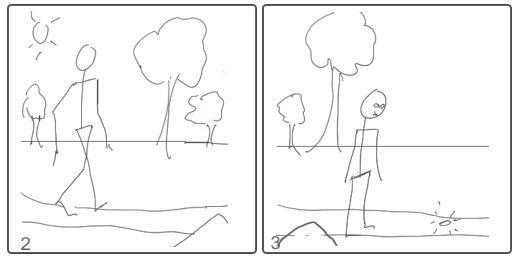 I think what we have to do is do a paintover of one of the frames of the storyboard and then superimose the Man,the Kid and the Teen onto each of the backgrounds(realistic and toon). 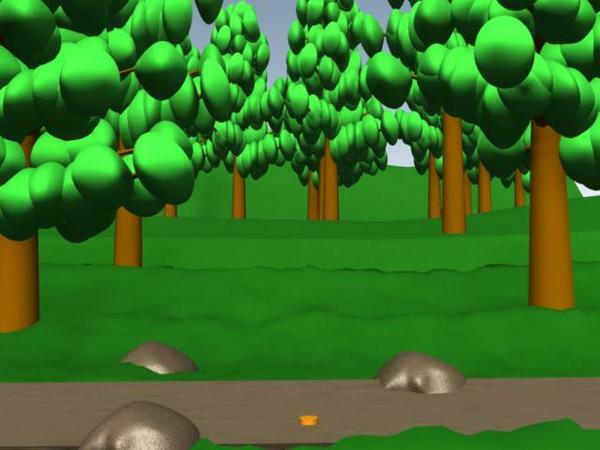 This should help us decide which way to go..
We could try a full color concept for Frame 2 where our character is just walking along before he sees the coin. We would need the following stuff. - Realistic background , everything but the character. - Toon background,, ,everything but the character. So , if anyone wants to tackle this here is frame 2 and 3 of the story board. Excellent idea with the paint over! But could we do this straight in the full screen format? Let me see what I can do about converting and altering my characters for the tests. Can we attached PSD's here? 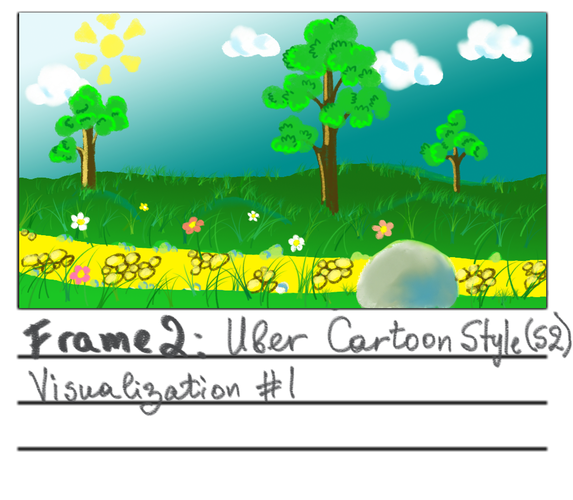 If not, here is my conversion of your frame #2, so that we could go straight from it to the storyboard template. I'll do some colors and post later. And if you are doing this , lets see your interpretaion of the Backgrounds. Just remember the viewpoint has to be the same so the character paintings composite well with the background. I doubt you can do PSD uploads but you never know , we should be able to mask out the white backgrounds in the character paintings and then compostie them to the different backgrounds. 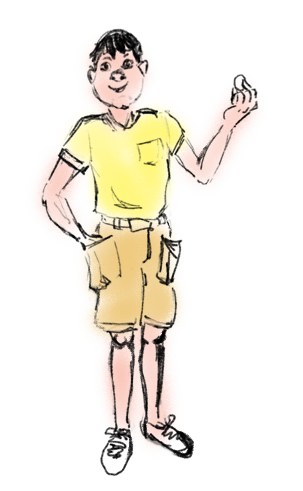 I am also attaching my character sketches on transparent backgrounds. Just for quick and rough visualizations. I didn't clean them up fully since this is just the roughest of estimations at this point. We are still throwing ideas around. Could you upload a transparent-background version of your character too? Feel free to show your versions of the setups :). And in the mean while I'll do the sketches for the other 2 styles I mentioned. (Although it might have to wait until tomorrow evening or Saturday morning). Getting REALLY interesting! Please do keep it up. Cool that it accepts PNG stuff , I will upload mine when I can. Here is my paintover of Frame2 of the storyboard and the Man character as a PNG file.. I have a more cartoon black outline to him which I think will look good when composited against the background .. This background should be doable in carrara.. I hope.. Okay guys , here is a quick animation test I did . I just used my "paintover" of Frame2 in Carrara's Scene/Backdrop feature and made sure "show backdrop" was turned on in the interactive render settings so I could see the Paintover all the time. I then inserted a rectangle mesh object and mapped it with the PNG of the Man character.. Did a simple animation just to see what the feel for this type of animation would be. I think we should set up some sort of group on youtube or vimeo as there probably will be lots of these test clips to be done along the way.. Here is the link to the youtube video.. What do you guys think. Wow, I am impressed. You are quick! :) I will post as soon as I get some time to sketch it. Give me a bit, please :). But I am also concerned about your time. The character has not been decided yet, so I am not sure it is worth spending time on. Mike, I love your background! I am a bit worried that the style will be hard to translate to 3D. If we go all out on realism (HowieFarkes style) it will slow us down on render time considerably. Do you think it can be faked somehow? Aslo, it looks really lovely with painted-on-painted compositing. How might the look convert to 3D? Here are my 2 other sketches. DISCLAIMER: these are exaggerated versions. Just to show overall direction a style might go. I am not suggesting we pick it up and run with it. 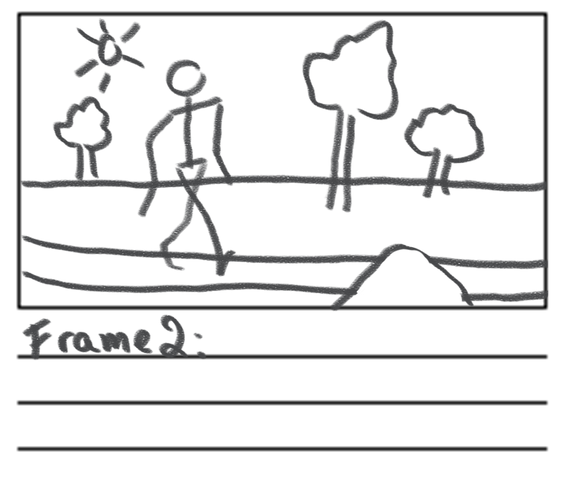 I also stuck as close to the original storyboard as possible for comparability. You will see they are completely different. But they are 2 different brands of stylization. Cartoony one is all rounded and colorful. It should be much simpler to shade (and probably model too), as most objects would not require custom maps. It should be very low-poly and thus lighter and quicker to render. The Goth version is much more angular and has more swirly lines and a more complex geometry. Fewer colors, but more advanced bump maps and maybe some interesting textures as well. Still fairly simple and low-to-medium polygon count for all environmental models. If we pick one of the styles below, I will do some more advanced sketches (more like Mike's). More serious ones too :-) , these are just doodles. Antara - don't be concerned about my time - I'm retired and time is about all I have plenty of:) Whether the character is used or not, I need the practice to learn to model decently in Carrara. I'm really impressed with your artistic talent and get quite envious when i see how some folk can express their thoughts so seemingly effortlessly. Realism is an issue of lighting quality and visual complexity more than anything else. The level of realism we achieve will likely depend on the proficiency of the lighting we can rig vs the number of frames we can accomplish. 10 minutes is a good length, but 20 minutes is better, if we can do it. Carrara offers wonderful tools in that regard so I am very hopeful. The technical direction team needs to decide soon what types of frame rates we can expect to render. If there is any aspect to which I will be obsessive it will likely be with the details of the lighting. I feel its probably time to start making some certain decisions about the test project, getting this underway and then looking forward to the full project. I like very much this cartoon on realism overlay concept. I look forward to what Roygee and his teams come up with. This thread is fascinating. Beautiful artwork from everyone. I have a couple of ideas which should speed things up in Carrara or fakes, I think the background is doable in 3d Great doodles of the cartoon background by the way. Yes I agree sketching out ideas inside of Carrara works too This has a nice toon feel to it. I posted the face sketches in the Concept Sketches Thread. Enjoy! :) And I look forward to seeing the modeled version. Please let me know how useful the sketches are and whether you need more or something different. Great idea as it shows the 3d-fied version. I was thinking of metaballs for the tree foliage silhouettes with some added geometry for some leaf details. Are these metaballs or spheres? But with cartoon in realism it would be a big challenge to make the look unified. And unified looks tend to look more unprofessional then artistic, unfortunately. 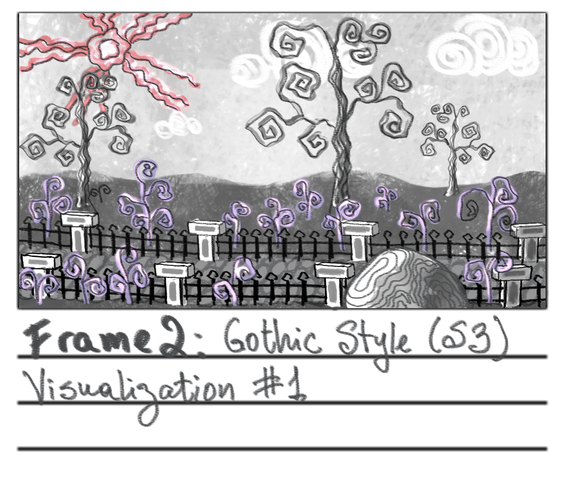 For the sake of time saving, at least in the test short, I would go for stylized on stylized. Especially since the theme lends itself very nicely to such approach. 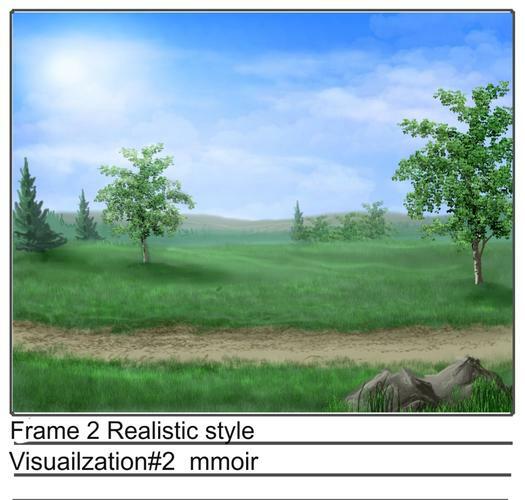 Also once we have some characters modeled, it might be easier to introduce them to some mock environments and see. I think this particular script is very character-driven, so if you have a character preference, let's pick one and go from there. :) Or if you want more options to choose from, let us know and we'll keep sketching. If going for cartoon style, don't forget the tools already in Carrara. This was a base tree from the Tree Generator. Minor adjustments in height and branch distribution. 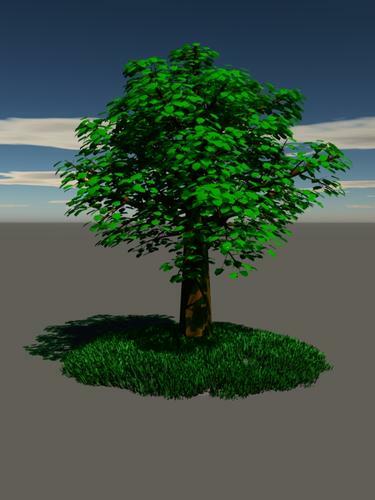 antara--yes those are just modeled spheres for leaves on the plant editor. I thought that was more a cartoon look. varsel- indeed those are always handy too. antara-----that looks awesome ........I like your clouds and landscape. I guess we can have lots of opportunities to great looks. What is kind of nice using carrara for storyboards if we can is that you can nearly capture what it would look like ------easier than a sketch for instance. Rich, this was more of an exception for me, though. I really am terrible at modeling, so I would not be able to model anything more complex than this. For example, there is no way for me to create a 3d version of the goth style, because the modeling for that one should be more sophisticated, and I wouldn't even know how to go about it :down: . antara --we all have some weak spots and better ones-------your drawing alone is awesome and will be very useful in storyboards for sure -- anything else you add is a wonderful addition and i know you will .....and I have a feeling this project has refocused a lot of people to Carrara again. And in so doing increasing all our skill levels no matter where they are at. I know I have become Carrara centric the last two weeks as I have become energized by this whole movie project idea. love that effect. it's just a matter of matching up the rest of the meshes w9ith that style. How did you do that shader on the clouds ? Works very well. I have the standard distant light in the scene (the one that comes with every scene) and 2 fake GI domes about 35 soft blue lights each. One is from above and each light is at 3% the other casts no shadows and is shining from below with each light at 1%. Antara-- yes that lighting is rather sweet. I really like how that looks. Nice job antara --that's worth saving as would make a great little cartoon scene set.